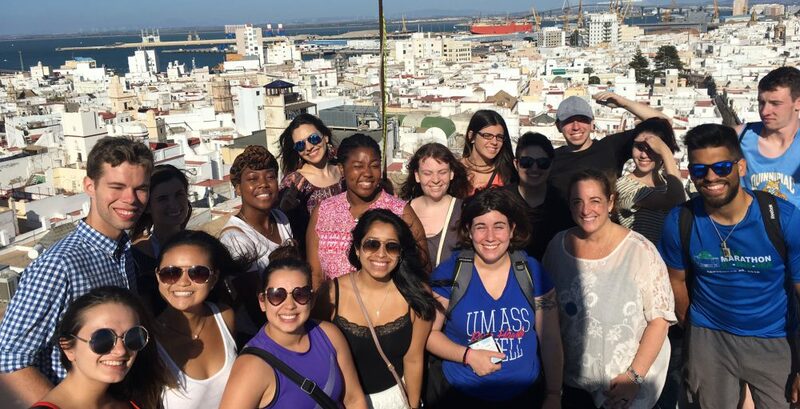 My experience in classes here in Cadiz has been amazing, although different than the majority of the students travelling with me. Due to my different placement, I was put into a class with several international students, rather than a class with just students also from UMass Lowell. There are students from Sweden, Scotland, Germany, Ethiopia, and Russia. It’s always interesting to hear our professor ask us to compare our own countries with that of Spain. At least once I day, I get to learn about another country in addition to Spain, and that’s incredible. It broadened my perspective of the world, especially since I was the only one from the United States, and the majority of the students are from Russia. For the most part, my class is completely immersive. Due to us all being from different countries, the only people with English as their mother tongue is myself and Mairi my classmate from Scotland. Many of the other students started learning English very young, but the fact that it’s not our collective first language means that we rely more on Spanish to communicate. This forces us to focus on practicing Spanish even more, because outside of class or when we ask each other questions we use Spanish as well. I think this is the biggest difference, and the biggest advantage to learning Spanish here in Spain rather than in a normal classroom setting. At no fault of the schools in the United States, the students tend to speak English to each other under their breath or outside of class. Here, Spanish is significantly more dominant than English and the added practice adds to the learning process. The set-up of classes here is also different than what I’m used to. Classes are Monday through Thursday, giving us longer weekends for side travel or extra studying. In the morning classes begin at 9:30, which is a nice time in my opinion. The first class is two hours long, followed by a half hour break in which we’re allowed to get a snack or coffee at the cafeteria and sit with other students. The cafeteria is always busy with students, and sometimes it’s hard to get your order taken before it’s time to return to class. My go to drink is café con leche (Coffee with milk). 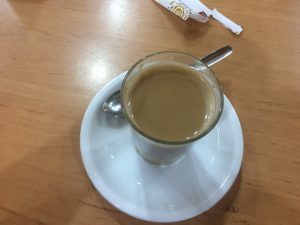 The coffee here is significantly stronger than that in the United States, so the milk (and lots of sugar…) help the taste, in my opinion. The second half of classes is from 12:00 until 2:00 with another professor. I think having two different professors is nice as well. It gives all the students two different perspectives and often two different styles of teaching. What was most interesting for me is that my professors didn’t have conversational English skills. This also forces me and my classmates to truly think in Spanish or even just to ask questions in Spanish. Again, it’s different from classes in the United States, because professors there speak both languages fluently. The material of the class I’m in (Nivel A2.2) has also has helped me greatly. It covers several grammar forms, some that I needed refreshing on, and others that I hadn’t had much practice with. It’s a helpful overview for anyone at the Spanish 3 or 4 level. I really enjoyed having both the grammar overview, the lesson taught in complete Spanish and being forced to practice speaking the language in and out of the class. I think all these things combined made for an extremely intensive and immersive study abroad experience. 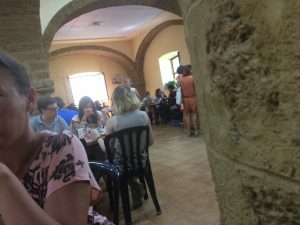 It’s truly helped me think in Spanish, to the point where I’ve had to go back through this blog and change a few Spanish words back to English! Today we ventured to three different locations each with it’s own unique and incredible features. First, was Vejer de la Frontera. This beautiful city is breathtaking and became more incredible with every fact I learned about it. The city is located at an altitude of about 200 meters above sea level and has about 13,000 inhabitants. Their patron saint is La Virgen de la Oliva, and the city has Moorish influence. 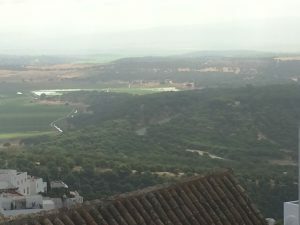 Since Vejer is located in such a strategic high position, it was often used as an enclave by different grouping of people who inhabited it, such as the Phoenicians or the Carthaginians. Later, it became a fortress against Muslim forces for many. 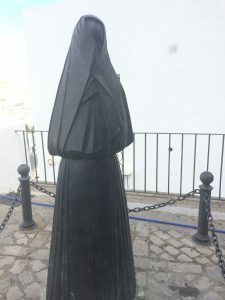 Another point of interest is La cobijada, which is both the type of outfit and a statue of a woman. She is covered from head to toe in a black costume, with the headpiece also covering one eye. It resembles somewhat the dress of Muslim women, and was influenced somewhat by many cultures encouragement of the modesty of women and was at one time the official dress of women in the city. Due to it’s altitude, Vejer was also a watch tower for pirates coming into shore or other attackers in the day. The beaches of Vejer all along the coast were also part of the site of the important Battle of Trafalgar, in 1805 where Britain defeated the French and Spanish. This allowed Britain to become extremely powerful in the next 100 years. Also a fun fact, fighting bulls are bred here. 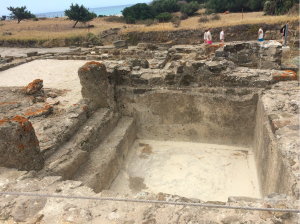 Bolonia contains the ruins of a Roman city, back from when Rome had control of Spain in the early first century. The Roman city is called “Baelo Claudia,” after the Roman Emperor Claudio. The remains of the city wasn’t discovered until around 1991. 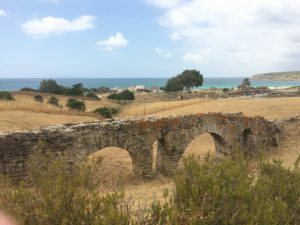 You can still see certain aspects of the city such as the remains of the baths, the theater, and the aqueducts. 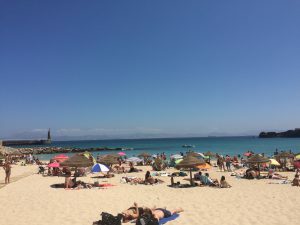 Bolonia is also extremely close to one of the most popular beaches, and also has a sand dune. 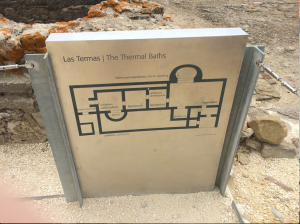 The baths, called Las Termas, were heated by a furnace that ran under each of the sections. To me, it’s incredible how they did this without the technology and knowledge we have today. 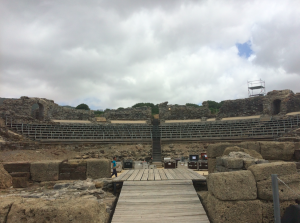 The theater was the typical amphitheater shape, in which it was a semi circle with passageways along the back for seating and essentially a backstage crew. It was currently in the process of being preserved further. Only a small part of the aqueducts remained. The aqueducts were of course used to bring water into the city for all purposes from personal use and the baths, to fountains or farms. Our last stop was in Tarifa, a port city. Nowadays, it is a common sight for tourists and a stop for many cruise ships. 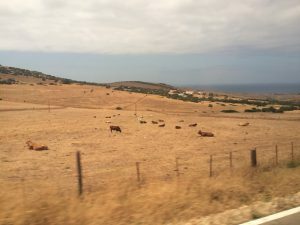 It is the most southern part of continental Europe as well. Therefore, the coast of Africa (Morocco) can be seen here. In my humble opinion, this was one of the most incredible things to see. I wish the quality of the picture was better, but it was faint even while we were there. Look out over the horizon, and what looks like a distant mountain is Morocco! In my opinion, all three cities are worth visiting. 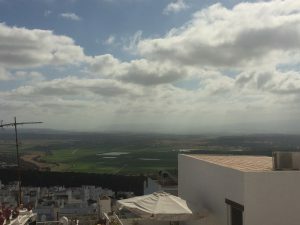 Vejer and it’s breathtaking view, Bolonia and it’s gorgeous ruins, and Tarifa and it’s vicinity to Morocco. These cities are places that I had never heard of until I visited there, and I am so glad that I went. I have been in Spain under a week and already I am awed. Every day never ceases to amaze me, and I think only today did it set in that I was truly here and that Spain has such a rich history and breathtaking cities and landscapes.